Every year I have a couple of New Year’s resolutions. I think. I can’t actually remember any of them. They’re always pretty vague, like “get fit” or “stop procrastinating”. 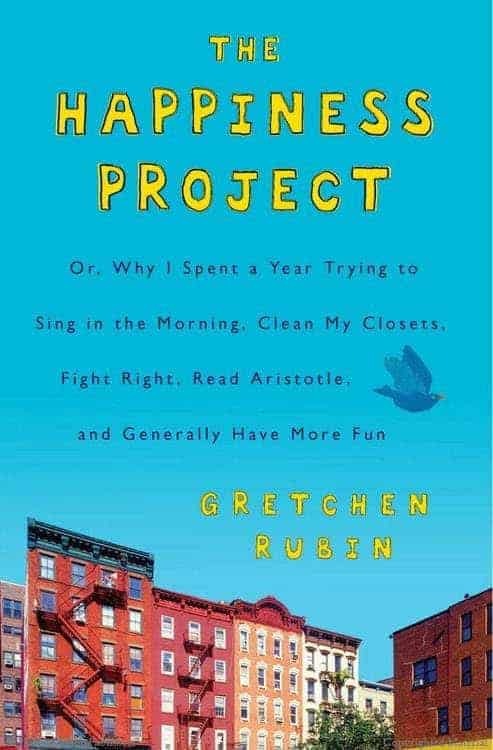 So, for Christmas, I bought my husband a book that I’ve been meaning to read for ages called “The Happiness Project” by Grechen Rubin, because while I don’t believe that we’re all supposed to be happy all of the time, I know that I struggle to appreciate what I have, and be mindful in the busyness of everyday living. The premise behind the book is pretty simple – we can all be happier if we’re prepared to put in a little bit of work. And it’s not wishy-washy, there’s no “get fit” on the list, and it’s not all one size fits all. But she shares her one year project, it’s full of practical steps that she took towards improving her own level of happiness and from that I’ve taken inspiration for my Happiness Project. I’d always vaguely expected to outgrow my limitations. One day, I’d stop twisting my hair, and wearing running shoes all the time, and eating exactly the same food every day. I’d remember my friends’ birthdays, I’d learn Photoshop, I wouldn’t let my daughter watch TV during breakfast. I’d read Shakespeare. I’d spend more time laughing and having fun, I’d be more polite, I’d visit museums more often, I wouldn’t be scared to drive. One April day, on a morning just like every other morning, I had a sudden realization: I was in danger of wasting my life. As I stared out the rain-spattered window of a city bus, I saw that the years were slipping by. “What do I want from life, anyway?” I asked myself. “Well … I want to be happy.” But I had never thought about what made me happy or how I might be happier. I had much to be happy about. I was married to Jamie, the tall, dark, and handsome love of my life; we had two delightful young daughters, 7-year-old Eliza and 1-year-old Eleanor; I was a writer, after having started out as a lawyer; I was living in my favorite city, New York; I had close relationships with my parents, sister, and in-laws; I had friends; I had my health; I didn’t have to color my hair. But too often I sniped at my husband or the cable guy. I felt dejected after even a minor professional setback. I drifted out of touch with old friends, I lost my temper easily, I suffered bouts of melancholy, insecurity, listlessness, and freefloating guilt. As I looked out the blurry bus window, I saw two figures cross the street — a woman about my age trying simultaneously to balance an umbrella, look at her cell phone, and push a stroller carrying a yellow-slickered child. The sight gave me a jolt of recognition: that’s me, I thought, there I am. I have a stroller, a cell phone, an alarm clock, an apartment, a neighborhood. Right now, I’m riding the same crosstown bus that I take across the park, back and forth. This is my life — but I never give any thought to it. I needed to think about this. How could I discipline myself to feel grateful for my ordinary day? How could I set a higher standard for myself as a wife, a mother, a writer, a friend? How could I let go of everyday annoyances to keep a larger, more transcendent perspective? I could barely remember to stop at the drugstore to buy toothpaste — it didn’t seem realistic to think that I could incorporate these high aims into my everyday routine. The bus was hardly moving, but I could hardly keep pace with my own thoughts. “I’ve got to tackle this,” I told myself. “As soon as I have some free time, I should start a happiness project.” But I never had any free time. 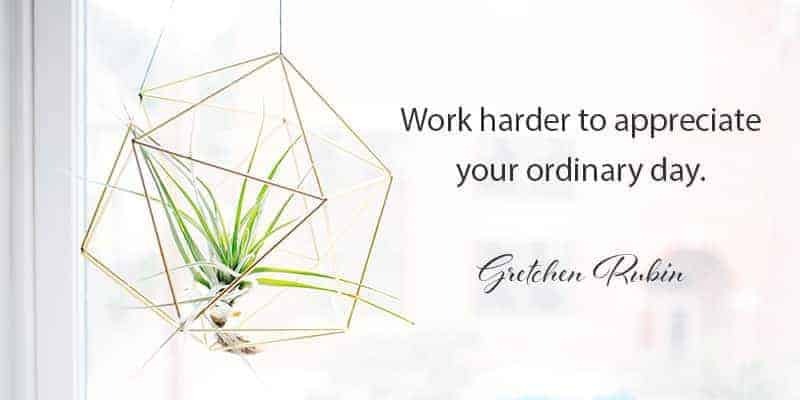 When life was taking its ordinary course, it was hard to remember what really mattered; if I wanted a happiness project, I’d have to make the time. I had a brief vision of myself living for a month on a picturesque, windswept island, where each day I would gather seashells, read Aristotle, and write in an elegant parchment journal. Nope, I admitted, that’s not going to happen. I needed to find a way to do it here and now. I needed to change the lens through which I viewed everything familiar. All these thoughts flooded through my mind, and as I sat on that crowded bus, I grasped two things: I wasn’t as happy as I could be, and my life wasn’t going to change unless I made it change. In that single moment, with that realization, I decided to dedicate a year to trying to be happier.